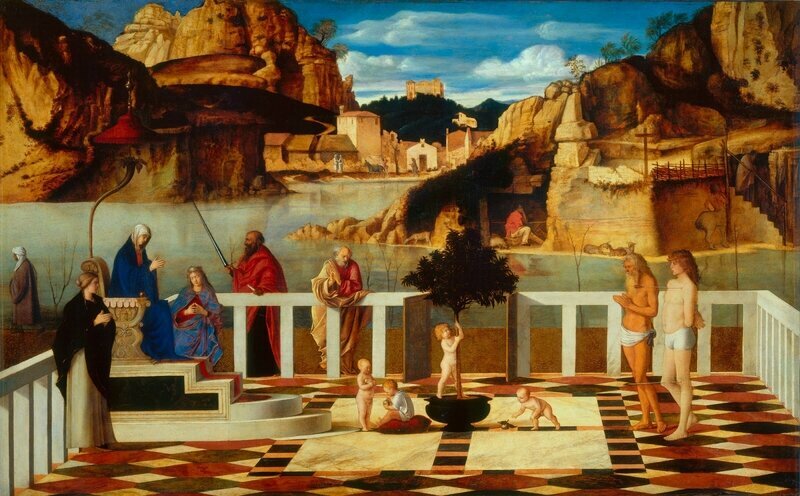 Giovanni Bellini, Sacred Allegory, about 1500-1504. Tempera (?) and oil on wood panel. Gallerie degli Uffizi, Florence. Photo: Scala/Ministero per i Beni e le Attività culturali / Art Resource, NY. 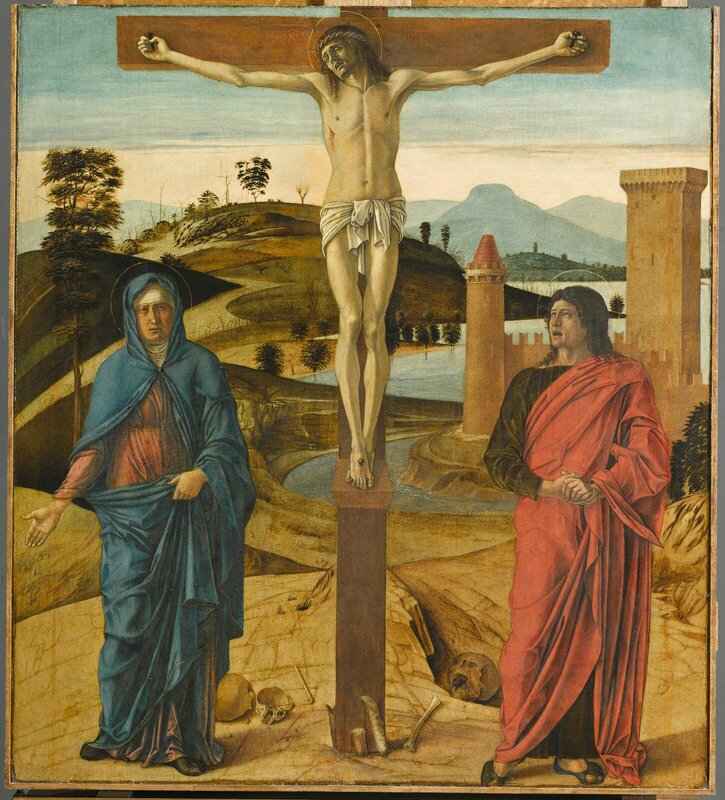 LOS ANGELES, CA.- One of the most beloved and influential religious painters of the Italian Renaissance, Giovanni Bellini (Venice, about 1435-1516) was also a master in depicting landscape. His paintings of religious scenes often featured evocative natural settings that were as important and affecting as their human subjects. On view October 10, 2017, through January 14, 2018, Giovanni Bellini: Landscapes of Faith in Renaissance Venice presents 12 paintings and one drawing that explore the poetic role played by the natural world in the artist’s religious compositions. 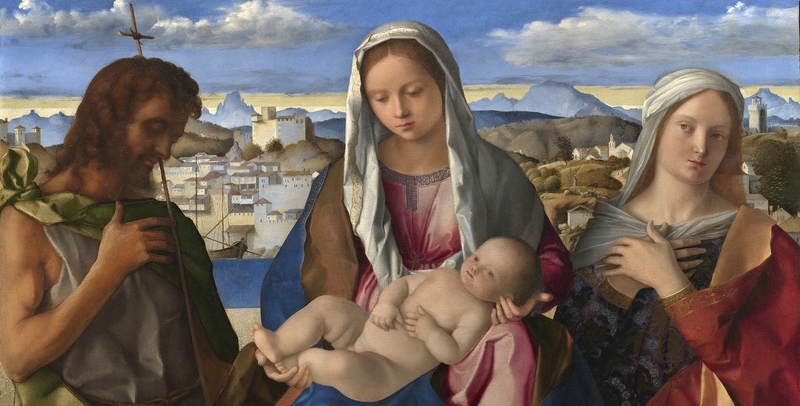 The exhibition includes several masterpieces that rarely travel, making this an exceptional opportunity to experience the artistic beauty and iconographic complexity of Bellini’s art. Giovanni Bellini was one of the most illustrious artists of the Italian Renaissance, admired for his accomplishments in all genres of painting practiced in 15th-century Venice, including religious subjects, mythological scenes, and portraits. He began his career painting small pictures intended for private devotion, later creating emotionally intense portraits as well as innovative altarpieces. Toward the end of his long life he added mythological and secular allegory to his repertoire. He was also one of the artists who championed the shift from painting in egg tempera, traditional in Italy, to painting in oil, a technique pioneered in the Netherlands. He operated a busy studio in Venice and trained many younger artists, including Giorgione and Titian. 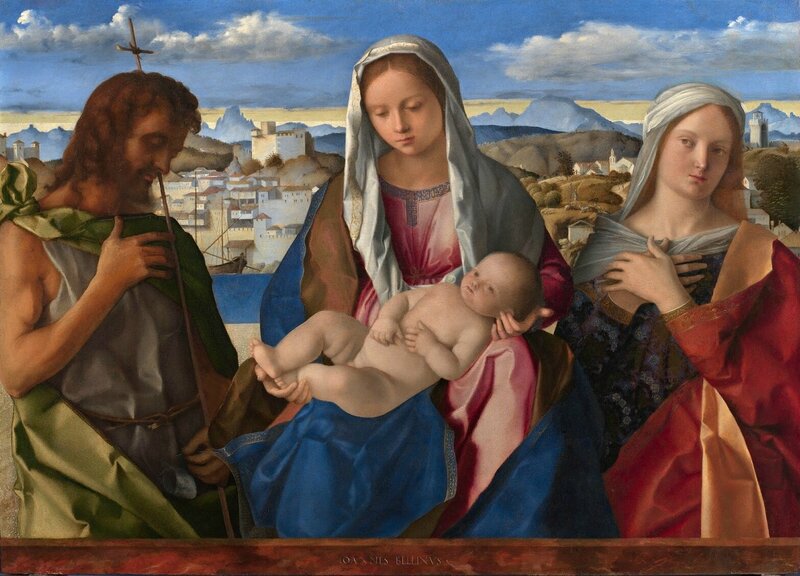 A standout among great artists both in his family and in his community, Bellini was one of the key figures who elevated the Venetian school to international repute. In some works, it is the figure that dominates the picture, with the landscape as a secondary but important element. 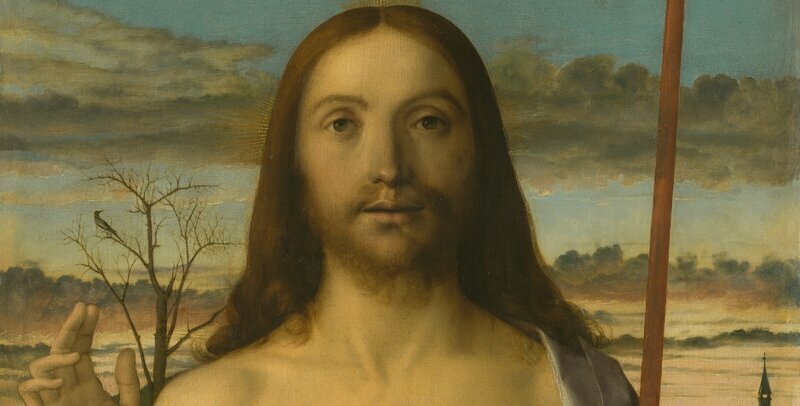 For example, Christ Blessing, about 1500, depicts Christ after having risen from the tomb, strikingly close-up and gazing straight at the viewer. In the background, the sun is rising in the hills, the sky is tinged with tones of orange, yellow and blue, and the three Marys hurry toward the tomb that they will find empty. The icon is fused with a narrative which evokes the landscape of the Venetian mainland, familiar to the contemporary viewer. 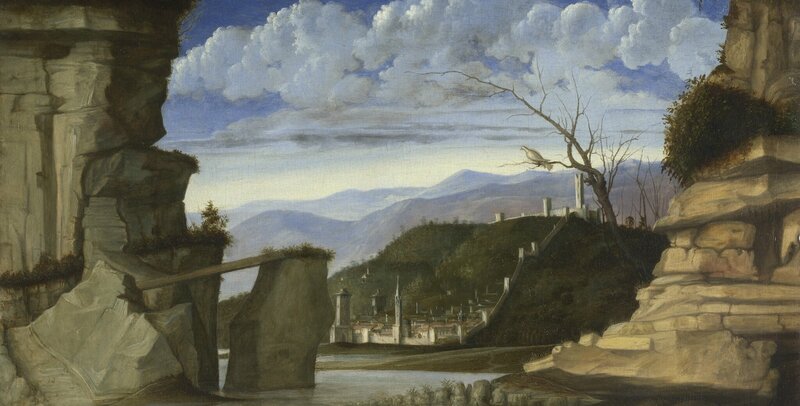 Sacred Allegory, about 1500-04, shows a mysterious cast of characters in an unusual landscape. The composition is divided by a marble terrace in the foreground and a resplendent landscape in the background. A clothed boy that may be the Christ child sits on a cushion shaking a tree that may be the Tree of Life. 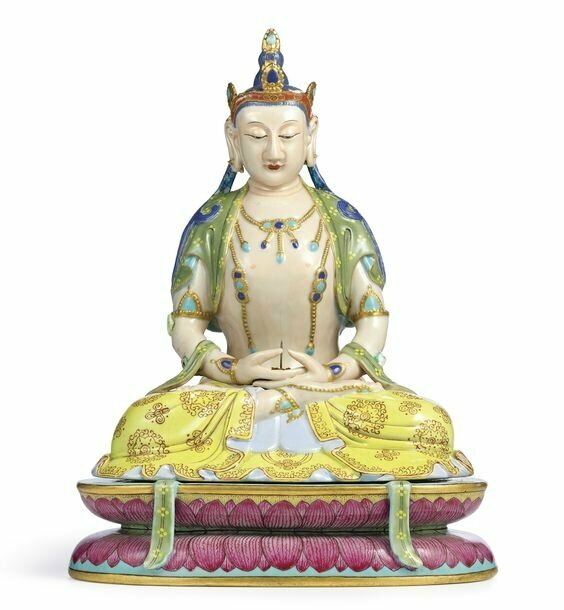 The Virgin Mary sits enthroned with her hands in prayer. Other figures in the picture include unidentified male and female saints. 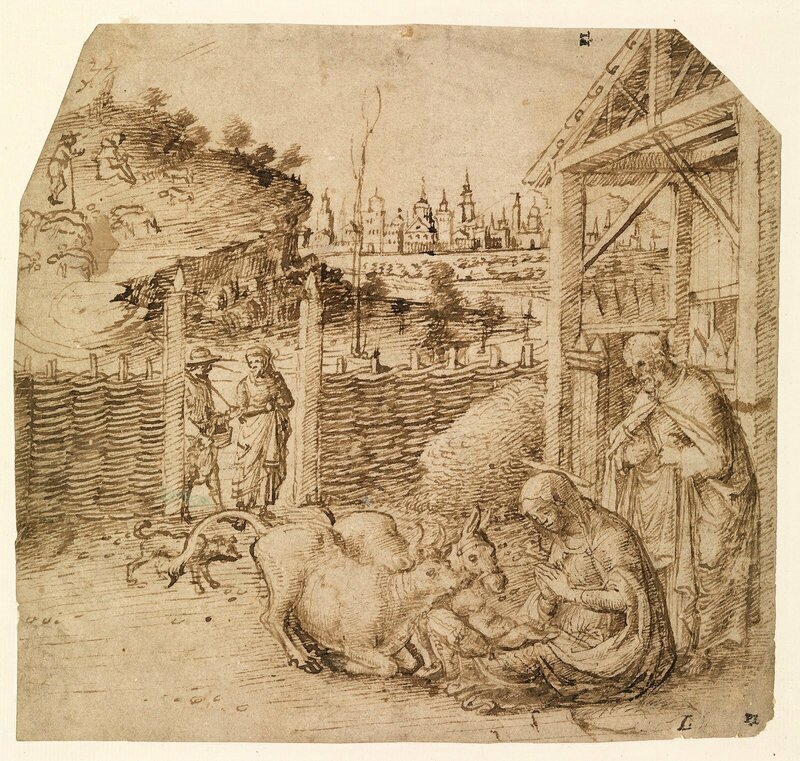 The picture was likely made for a sophisticated art lover who was able to understand the complex meaning of the scene and at the same time to appreciate the supreme skill of the artist, possibly the Marchioness of Mantua Isabella d’Este, one of the most celebrated collectors of the Italian Renaissance. 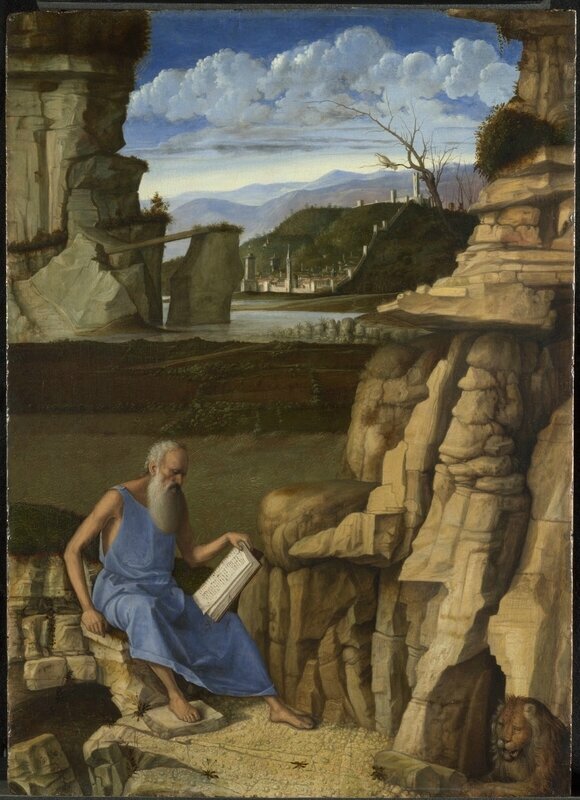 The exhibition also includes one of Bellini’s earliest surviving works, Saint Jerome in the Wilderness, about 1455, which depicts the saint as a penitent hermit blessing a lion. 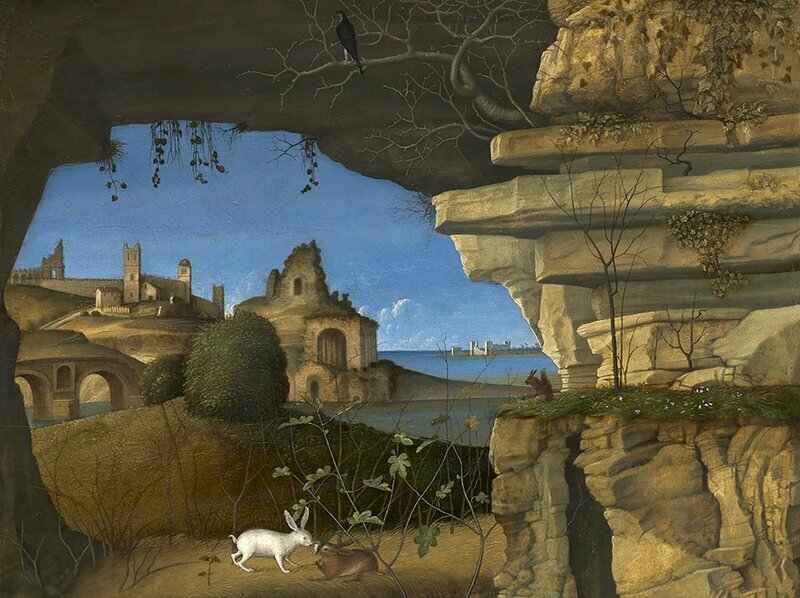 He reads in a cave that dominates the picture’s foreground, while a broad, deep landscape opens out into the background. 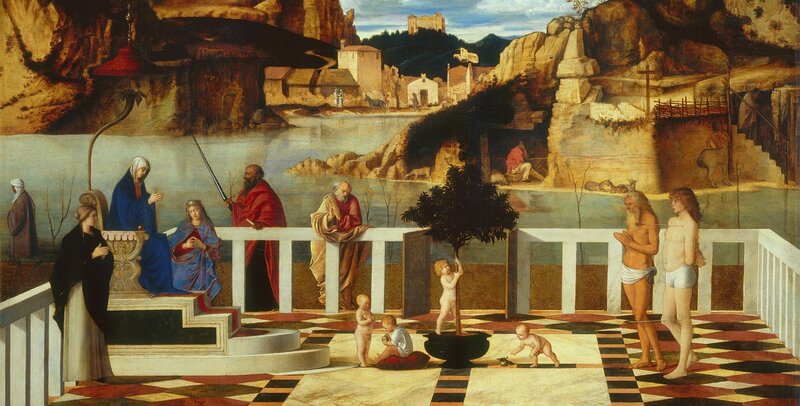 Rather than evoking the Syrian desert of the fable, the scenery recalls the gentle slope of the Venetian mainland, a feature of many of Bellini’s paintings. Giovanni Bellini, Sacred Allegory (detail), about 1500-1504. Tempera (?) and oil on wood panel. Gallerie degli Uffizi, Florence. Photo: Scala/Ministero per i Beni e le Attività culturali / Art Resource, NY. 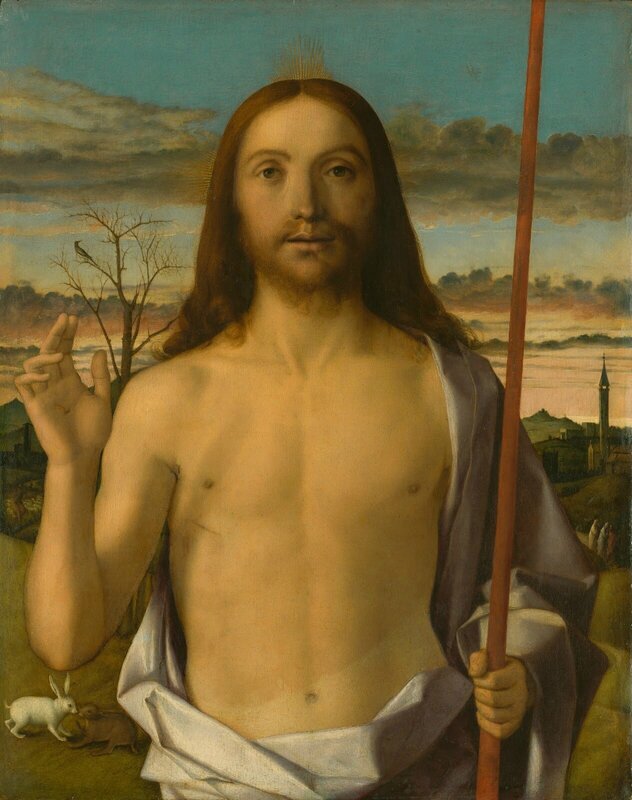 Giovanni Bellini, Christ Blessing, about 1500, tempera and oil on wood panel. Kimbell Art Museum, Fort Worth, Texas. Giovanni Bellini, Christ Blessing (detail), about 1500, tempera and oil on wood panel. Kimbell Art Museum, Fort Worth, Texas. 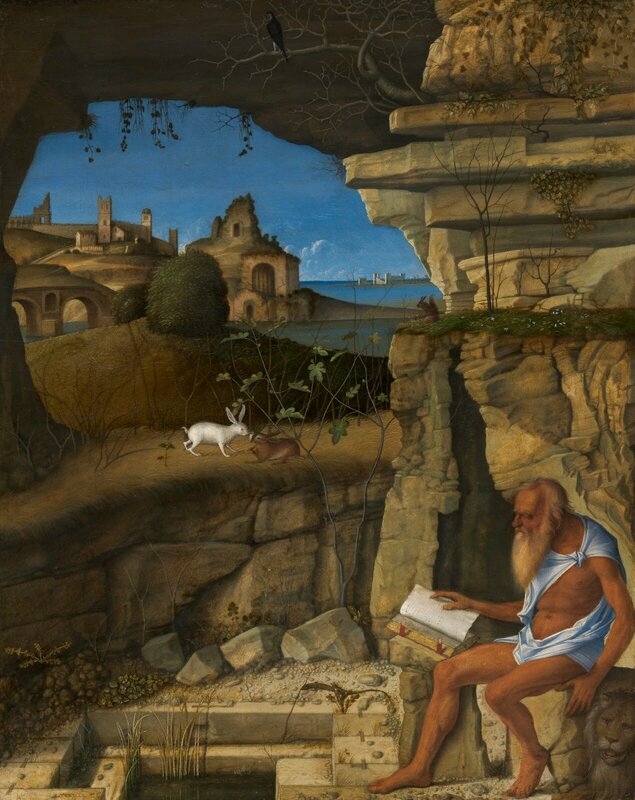 Giovanni Bellini, Saint Jerome Reading in the Wilderness, 1505, oil on wood panel. National Gallery of Art, Washington, Samuel H. Kress Collection, 1939.1.217. Image courtesy National Gallery of Art, Washington. 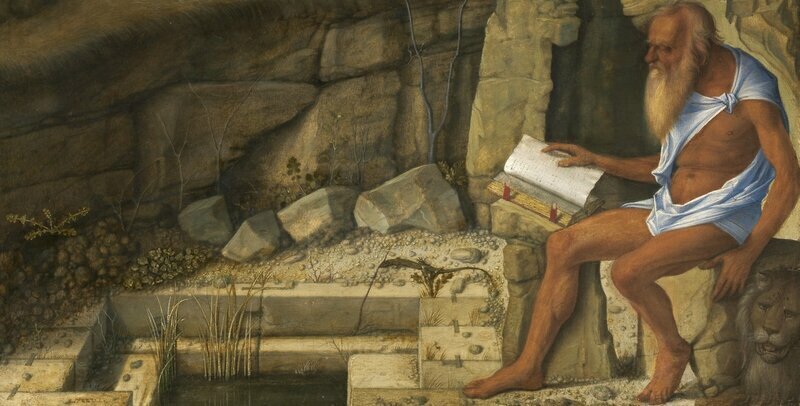 Giovanni Bellini, Saint Jerome Reading in the Wilderness (detail), 1505, oil on wood panel. National Gallery of Art, Washington, Samuel H. Kress Collection, 1939.1.217. Image courtesy National Gallery of Art, Washington. Giovanni Bellini, Saint Jerome Reading in the Wilderness (detail), about 1485, tempera and oil on wood panel. National Gallery, London. 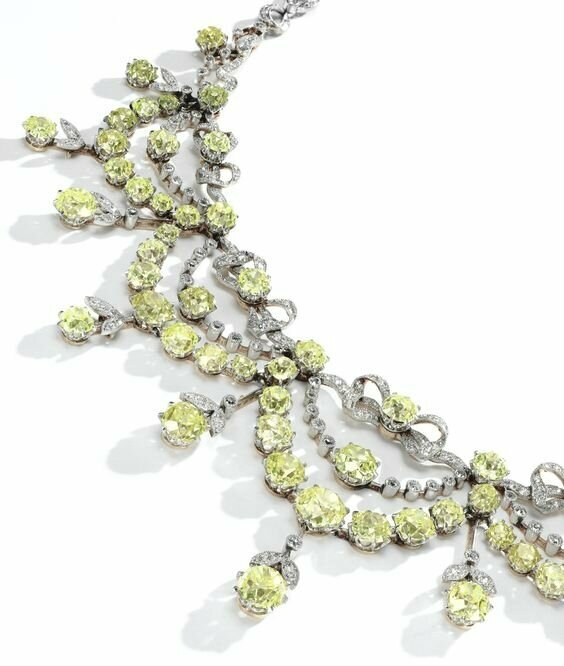 Bought, 1855. © National Gallery, London / Art Resource, NY. Giovanni Bellini, Virgin and Child with Saint John the Baptist and a Female Saint in a Landscape), about 1501, tempera and oil on wood panel. Gallerie dell’Accademia, Venice. Photo credit: Scala/Ministero per i Beni e le Attività culturali / Art Resource, NY. Giovanni Bellini, Virgin and Child with Saint John the Baptist and a Female Saint in a Landscape (detail), about 1501, tempera and oil on wood panel. Gallerie dell’Accademia, Venice. Photo credit: Scala/Ministero per i Beni e le Attività culturali / Art Resource, NY. 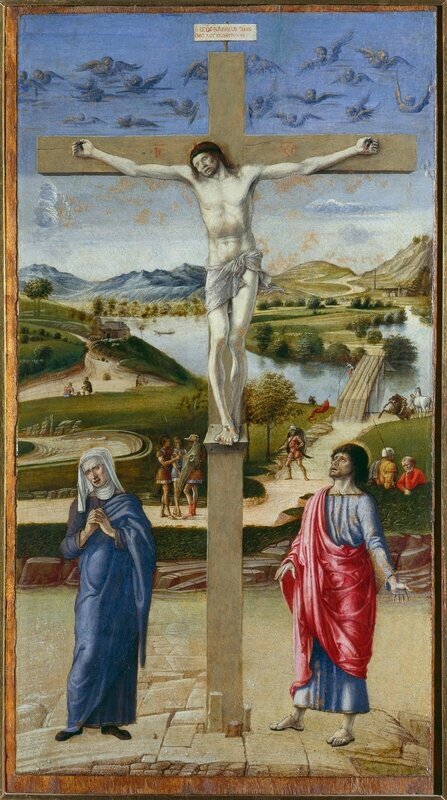 Giovanni Bellini, Crucifixion with the Virgin and Saint John the Evangelist, about 1458-59, oil and tempera on wood panel. Fondazione Musei Civici di Venezia, Museo Correr, Venice. Photo credit: Cameraphoto Arte, Venice / Art Resource, NY. Giovanni Bellini, Crucifixion with the Virgin and Saint John the Evangelist (detail), about 1458-59, oil and tempera on wood panel. Fondazione Musei Civici di Venezia, Museo Correr, Venice. Photo credit: Cameraphoto Arte, Venice / Art Resource, NY. 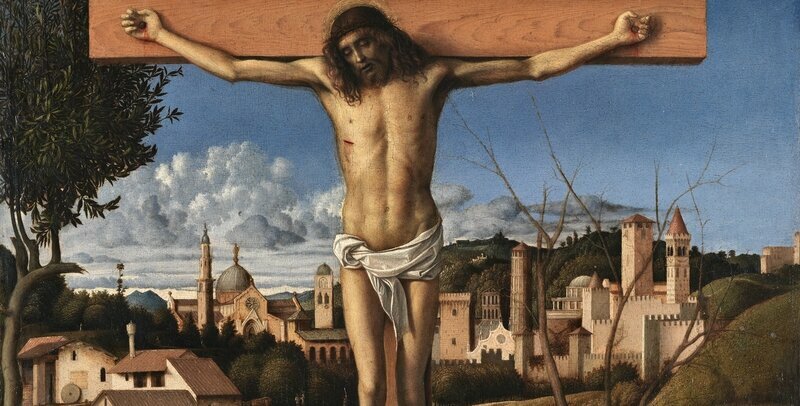 Giovanni Bellini, Crucifixion, about 1495-1500, Giovanni Bellini, tempera (?) and oil on wood panel. Collezione Banca Popolare di Vicenza. 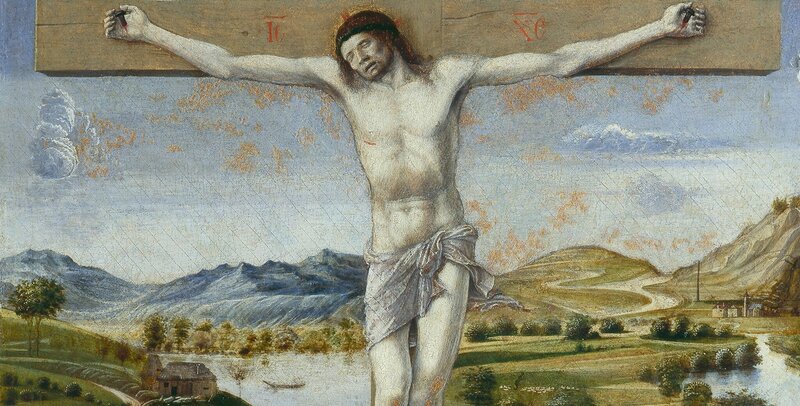 Giovanni Bellini, Crucifixion (detail), about 1495-1500, Giovanni Bellini, tempera (?) and oil on wood panel. Collezione Banca Popolare di Vicenza. Exhibition at denver art museum features paintings by titian, giorgione and bellini rarely seen in the u.s.